Recent unseasonably summery weather had led Isaac Baker to opt for a holiday theme for his Table Topics session. Most participants rose bravely to the challenge, with cherished memories of places as far apart as Morecambe, Cornwall and Banff in the Canadian Rockies. Two speakers rather let him down, however. Jen Cashmore, invited to recall a favourite outdoor meal, revealed a preference for the comforts of home, the sofa and the TV to open-air gastronomy; while Caroline Bellhouse, asked about her favourite ice cream, explained that she didn’t like the stuff at all, and amazed her audience with a description of a Malaysian equivalent featuring shaved ice and sweet corn! In the first of the prepared speeches, a more serious note was struck by Isaac’s Mum Jackie Baker, with her thoughts on the importance of managing her personal time. This brought out the surprising detail that one day she had to admit to an unimpressed husband that she had spent 4½ hours looking after the dog! Humour was never far from the surface in the confidently delivered icebreaker speech by new-dad-of-three-months Paul Davies. His subject – French Kids Don’t Throw Food – examined differences between the French and British ways of bringing up children. He identified three key principles: teach them to wait, give treats at just one time of day: and feed kids the same food as adults – giving them their veg first while they are really hungry! “...and I thought he was such a nice young man” was Steph Bilton’s wistful comment as she began her evaluation of Will Dutton’s provocatively titled How To Lose Your Friends. It turned out that this was through the game of Monopoly, in which Will is obviously an expert. His advice: be as greedy as possible; drive a hard bargain when trading properties; and build houses and hotels aggressively. His tongue-in-cheek talk really engaged his listeners, generating an animated post-speech discussion and the evening’s Best Speech ribbon for Will. Steph Bilton’s recollections of her time as a maid-of-all-work and a marine attraction in Morecambe won her the Best Table Topic vote, while Jen Cashmore’s forensic appraisal of Jackie Baker’s speech was judged best evaluation. Next meeting will be at the Great Malvern Hotel at 7.30pm on Tuesday May 14th guest welcome. Annual committee elections saw veteran member Roger Granville elected President for the coming year. Next meeting will be on at 7.30pm on St George’s Day, April 23rd at the usual venue, the Great Malvern Hotel. 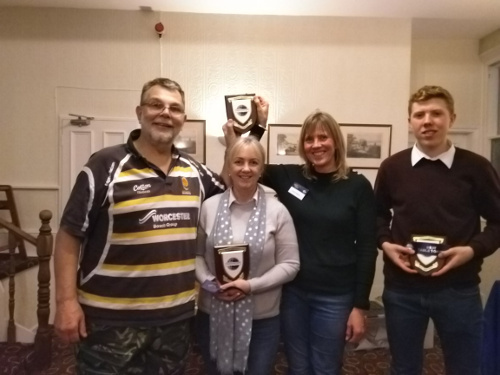 There was a rare achievement at last week’s meeting when a member making his debut ‘icebreaker’ address won the evening’s vote for Best Speech. It was the more remarkable because it came from someone for whom English is not his first language. Romanian-born Andrei Rezmeriță, now resident in Hereford, spoke with confidence and a fine command of English as he mused on life and happiness. 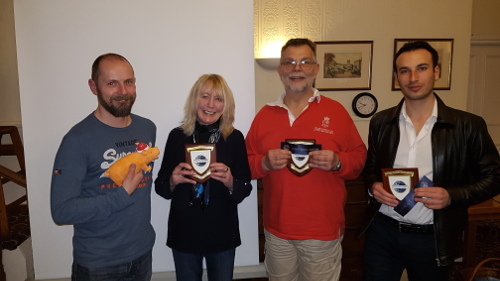 It was an additional accomplishment in that he outpointed two other very experienced speakers in Jen Cashmore (President of the recently formed Worcester club and a Divisional finalist in this year’s Toastmasters International speech competition) and Karen Lowen, who had stepped in at the last minute to fill a gap in the evening’s programme. Jen’s speech, remarkably entitled The Body Is Its Own Pharmacy And Delight Writes The Prescriptions, was a plea for a positive and cheerful attitude to life as the best antidote to ill health. As always she seasoned her talk with relevant statistics, including the remarkable one that 90 per cent of all illnesses treated by the NHS are stress-related. Stress, she claimed, suppresses the natural pharmacy of the body. More light-hearted was Karen’s address ‘Man: The Instruction Manual’ in which she fancied she had obtained a bionic man by mail order and she imagined what such a book of rules might say. She used it to make a few telling feminist – if not sexist! - points, all delivered in her usual upbeat humorous manner. The evening had begun in somewhat surreal style with Roger Granville’s Table Topics session. Somerset-born Roger, using his authentic Wurzel accent, invited speakers to be witnesses at the trial of two youths accused of the heinous crime of having tipped over a cow in a field on Christmas Eve – yes really! Victims rose imaginatively to this unusual challenge, with Steph Bilton’s use in evidence of the imprint of shoe sizes in the muddy field voted best. Steve Birch won the best evaluator's ribbon for his assessment of Jen Cashmore’s speech. Next meeting will be at the Great Malvern Hotel on Tuesday April 9th at 7.30pm. Visitors from near or far are always welcome – there was one from Liverpool this week! View the next meeting details including the structure and roles. View the previous meeting agenda. Find out more about the new and improved programme Pathways and begin your journey.